The American Running Horse has been a sport horse from its inception in the early 1600s, selectively bred for racing, hunting and saddle disciplines from horses specifically imported for those uses. This colonial breed provided the performance genetics that power our sport breeds even today. "Horse racing was America's first pastime (documented from 1624), and our early racehorse was based on the imported racehorses of England and Ireland, which were the English Running Horse and the Irish Hobby. The Thoroughbred did not exist for another forty-six years (1670), and America did not receive any Thoroughbreds until the mid-1700s. Our racing breed--the American Running Horse--was being selectively bred for racing by at least 1624...Our imported root stock was the result of centuries of selection for racing in the British Isles, and when it got here, it continued to be selectively bred for speed at both the pace and the gallop." (Standardbred Sport Horses, chapter 1 ). This expanded study is provided for those of you who are unaware of our continent's wonderful equine sport history. Many of you have been under the warmblood industry instruction for decades and never even considered that better sport genetics might be sitting right in front of you. Indeed, back in 2003 the World Breeding Federation for Sport Horse Breeders was stating that America rarely breeds sport horses, and that the Americans are too materialistic and uncultured to have created a sport horse breed themselves, instead they said that we merely buy what others have taken centuries to develop (Breeding News for Sport Horse Breeders, 4/2003 editorial). Well, you might reason the European have this uneducated view because of the basic differences in our cultures, because our government does not oversee our breeding like theirs does, and so that we do not have a 'national' breed like they do, especially one specifically bred for the Olympic style sports. And I have even heard this argument from North Americans--that because we don't have a separate stud book for those of our breeds that are used in this form of sport (eventing, dressage, jumping, driving) that our breeds are not real sport horses. What these equestrians don't realize is that we have no need for a separate stud book for this style of breeding because our breeds and their ancestors have ALWAYS been bred for those alternate forms of sport and its prototypes. Recently (2018) I ran into a variation of the European narrative in a discussion with a German warmblood breeder that surprised me. He confidently told me that horse sport developed on the continent, not in the British Isles, and he even said that the Thoroughbred was really a product of Germany, not England. I know, you think I must be kidding...believe me I was amazed too. The truth however is totally opposite their published opinion and believed myths, in fact America has always bred sport horses, and the root stock that powers modern equine sport came from the British Isles, not the continent. And our sport bloodlines even provided some of the ability that those horses of the continent perform on. So, the truth is the European's are late-comers to this type of sport industry. I gave parts of the history of sport, and the tracing of sport bloodlines in my books, and in the most recent: Standardbred Sport Horses, I go into great detail on the colonial era and its resultant bloodlines because I discovered of all our breeds the Standardbred preserved more of the original Running Horse lines than the others. Knowing most of my readers can't quite get their head around the idea of the Standardbred being a sport resource for them (a temporary problem I hope) and therefore won't read the book, I am providing a collection of the source material here and in the following two parts, so that you too can see for yourself the traveling of sport traits coming from the Celtic Horse of the British Isles (Irish Hobby and English Running Horse), and from there to the colonies, where its gifts were captured and concentrated. It will be helpful for us therefore to gather a sample of the original written sources on that horse that became the American Running Horse, the descriptions and the observations of our colonial race-hunt-saddle breed and its ancestry in one place, so that you can see for yourself, and if truly energetic you may visit the sources yourself. Because this report is so massive it will be divided into three parts: Part I Introduction and Root Stock, Part II Virginia-Maryland Colonies and Part III Massachusetts Colony and Conclusions. The references used for this study are attached on this pdf. This report only covers the colonial development of the Running Horse, even though the breed existed until the early 20th century. The Running Horse spawned most of our modern sport breeds, and you can read an outline of that further development here, and in Legacy of Lexington about the American Thoroughbred and in Standardbred Sport Horses the story of our Standardbred (see book info ). The type and ability of our future sport breeds was set in place by this original sport horse breed. "It is a fact that before the Revolution racing in all its forms was a more universally indulged in as an amusement than was the case until several decades later when it again began to resume its popularity. This was before newspapers, and all we can ever know of these sporting events of the period we must gather from the detached fragments that have come down to us by traditions..." (Farschler). It was not that long ago, even though I had been a avid equestrian since high school (50 years ago), that I first heard something about this breed. As I searched out the evidence I became astonished that knowledge and pride of this breed was not part of our modern equine narrative. I provide this collection of original source material in the hope that you will find, as I did, that the fact of our colonial racing culture and its wonderful racehorse-sport-saddle breed are not a bit of wishful thinking, but rather that you will discover it is instead hard historical fact. 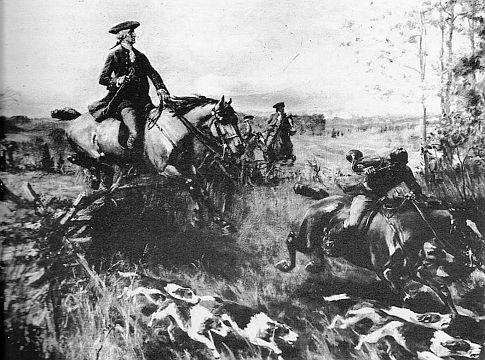 The American colonists were intelligent and resourceful breeders, who knew what they wanted, and they imported the best racing stock in the world and bred on from there a sport horse of such solid genetic superiority that today--four hundred years later, this colonial breed is powering our winning sport horses. Unlike other places that bred sport horses, there was no domestic draft, agricultural or cavalry horse to breed 'up' from...our original stock was the best sport equine in the world, and its resultant breed preserved and perfected all its best characteristics. If you google 'American Running Horse' you will get listings of articles or posts on the Quarter Horse and its sprint racing branch, and technically that is correct because the Quarter Horse literature preserved the colonial title of Running Horse for their later developed breed. The Quarter Horse is only a small portion of this breed however, and all of our best domestic breeds originated with this colonial created breed, of which there was still a purebred remnant in the early 20th century and still discussed as a breed and type in the college animal husbandry courses and texts of 1919 and 1925 (Plumb and Curtis). In the time between 1624 and 1925 this premier sport breed, which was called the Virginia Running Horse (aka Native American Woods Horse) and the Narragansett Pacer, gave birth to the breeds of American Trotter, American Saddle Horse (Plantation Horse), Morgan Horse, Canadian Pacer, Standardbred, American Thoroughbred, Quarter Horse, and Saddlebred, Tennessee Walker and Missouri Fox Trotter, and all the spin-off breeds of these horses. Truly, the American Running Horse defines the North American equine. 1.Colonies: Virginia 1607 and Massachusetts 1620 were the incubators of this breed, and their stock in large part established the seed sport populations for the other colonies. These colonies were English settlements and were subsidized by various groups or companies, such as the London Company or the Virginia Company. The investors in these ventures were expecting a financial return eventually in crops or goods. The settlements were designed in that each would have a resident Governor, and then there would be plantations run by onsite owners or managers. There was also a secondary population of craftsmen, such as planters, brick makers, ship builders, coopers, blacksmiths, carpenters etc and then there were indentured servants and later slaves for the unskilled labor. Some of the settlements did not survive, either the supply source failed before the group was self-sufficient, or disease or massacres wiped them out. Sometimes the 'companies' failed back in England, and the colonists were set adrift unless another company formed to supply it. The Roanoke colony for instance set in North Carolina area in 1585 on Roanoke Island failed terribly and while many of the colonists were able to leave on ships, the ones remaining were lost. The supply from the company, headed by Sir Walter Raleigh failed, and the few that remained on the land were basically abandoned. When years later (1590) supply finally arrived there were no survivors found. Jamestown, settled by the Virginia Company, was established in 1607 and became the first permanent (successful) colony. Virginia's main cash crop became tobacco, and it made the colony rich, and it was used to pay debts and even race purses were in tobacco. The nearby Maryland colony was not begun until about 30 years later, but tobacco became king there as well. The Massachusetts colony founded in 1628, settled around the Boston/Salem ports, was established by the Massachusetts Bay Company, and it absorbed the previous failed colony of Cape Ann (1623). The successful Plymouth Colony (1620) was of a different type as it was settled by Puritan Separatists (Pilgrims), but later merged with the larger Massachusetts colony, and in 1636 the colony expanded with settlements in the Rhode Island and Connecticut areas which later on became instrumental in the development of a racing breed there. The Massachusetts colony at one time included the Nova Scotia, Maine, New Hampshire, Massachusetts, Rhode Island and Connecticut. 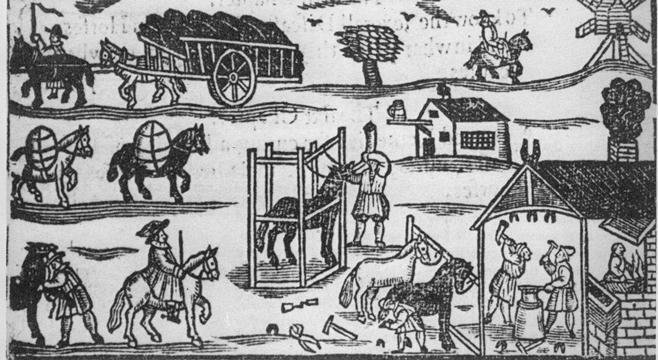 By 1640 the cash crop was horses, mostly utility type, which were bred for the supply of the West Indies sugar plantations. The whole area in 1691 was named the Province of Massachusetts Bay. These two colonies created by selective breeding a sport horse of such excellence that its genetics are still powering our successful sport horses. Their racehorse populations were the seed stock from which the later colonies received their racing-hunting stock. The Thoroughbred, which most have assumed was the source of our spectacular modern racehorse breeds, did not reach the colonies until 100 years later and then only in small amounts setting type on some already established Running Horse branches. The historical records shows that the speed/stamina base, the gaits and jump ability along with hardiness and good disposition came from our own native racing breed. Both the English Thoroughbred and our native Running Horse arose from the same base: Irish Hobby and English Running Horse, therefore they are cousins that developed into breeds at the same time on different continents. When they were returned to each other certain individual Thoroughbreds nicked exceptionally well with our breed. 2. The Atlantic coast, except on the immediate shore was heavily forested, and had to be cleared to grow crops. This fact of colonial life effected the equine development in that the Plantation owners walled off areas to protect their stock, sometimes on peninsulas, and the general populace kept their horses and other livestock loose in the forest with the crop areas fenced off. A common name for the colonies' horses: Native American Woods Horse resulted from this practice. Native Americans in the eastern American continent, called Indians, did not own horses and the few existing horses of the plains Indians (Mustangs) were separated from the colonies by 1500 miles of forest, mountains and rivers...therefore there was little or no cross-breeding with the Spanish Horse stock left by the Conquistadors for 150 years. The Virginia stock was supplied almost exclusively by Ireland as the colony had a treaty with them for the supply of all their livestock. The early horses into the Virginia colony were ordered and purchased by the Plantation owners and governors, while the general population: planters, fishermen, carpenters etc, did not own horses until the mid-century. In the Massachusetts colony the early stock was shipped from England and Ireland, mainly English Running Horses, usually for the upper class, such as the Governor in the beginning. These horses were for riding and hunting pleasures of the ruling class at first, but more quickly there than in Virginia they came into the common people's hands. Irish horses were recorded coming in along with Irish immigrants into Massachusetts during and after the Ulster Uprising in the mid-1600s. Harness horses were of no use until the later road development. There were more inroads into the gene pool in this colony than in Virginia-Maryland, as the nearby Dutch colony of New Amsterdam had the Dutch Cob, and the cross breeding of the two breeds was quite common producing useful pack and all-purpose horses. New Amsterdam was taken over by the English in 1664 and the first 2-mile race track was put there on the flats of Long Island, called Newmarket after the concurrent track established by King Charles... heat racing was practiced on this track, by Running Horses--no Thoroughbred to that area until 70-80 years later. First we need to explore the nature of the horses that we originally imported into the colonies. My goal is to illustrate for you the continuous sport traits that began with the ancient Celtic Horse and traveled intact to our colonies. By citing the original observations and reports, and quoting from them I hope you will be able to see for yourself the unbroken genetic line. "Out of the same Spaine, from parts called Gallica and Asturia, certain ambling jennets or nags are bred, which we call Theildones, and of lesser stature and proportion every way named Asturcones. These horses have a pleasant pace by themselves differing from others. For albeit they be put to their full pace, a man shall see them set one foot before the other so deftly and roundly in order by turns, that it would doe one good to see it, and here upon horse breakers have an act by cords to bring a horse to like amble"
Pliny was describing the four-beat gait of the running walk, rack or amble, unique to gaited horses, which many of the descendant breeds of today have retained, and the Romans liked it so much they endeavored to train non-gaited horses to move this way. When the Romans invaded England (circa 60 AD) they were met by warriors in chariots. These were the Celtic Horses which had arrived with Phoenician ships and exchanged for the tin mined there from 700 BC on. Both the Irish Hobby and the English Running Horse arose from this Celtic Horse, and they too were fast, stamina loaded, gaited, hardy and had a docile temperament. These traits have been hallmarks of the breed and its best descendant breeds ever since as you will see reported below. Contained on islands, the integrity of this gaited-saddle breed remained in place, more so in Ireland as Britain had many inroads from less athletic breeds. And it was this breed that made up the genetic base of the 17th century racing studs of Sedbury, Tutbury and Helmsley in England and the 16th century studs of Ossory, Ormond, Kildare and Desmond racehorse studs of Ireland. The mares from this breed formed the speed base of the later Thoroughbred, and of the sport traits found in the Irish Draught Horse and the Connemara Pony, as well as our own Running Horse breed in North America. (Read more on the Irish Hobby). * William Stephanides, also known as Fitz Stephen, an English Monk at Canterbury, wrote in the 12th century about a scene of a London horse sale, held at Smithfield. He wrote in Latin and it was translated into English. His observations illustrate for us that the pacer was the most valued breed in England at that time (1100s), fit for the earls, barons and knights, as he compared it to the trotter who he says is fit for the lower class esquires. "It is pleasant to see the nags with their sleek and shiny coats, smoothly ambling [ pacing] along, raising and setting down alternately as it were, their feet on either side; in one part [of the field] are horses adopted to the Esquirers there whose pace is roughter, yet expeditious, lift up and down, as it were, the two opposite fore and hind feet [trotting] together." 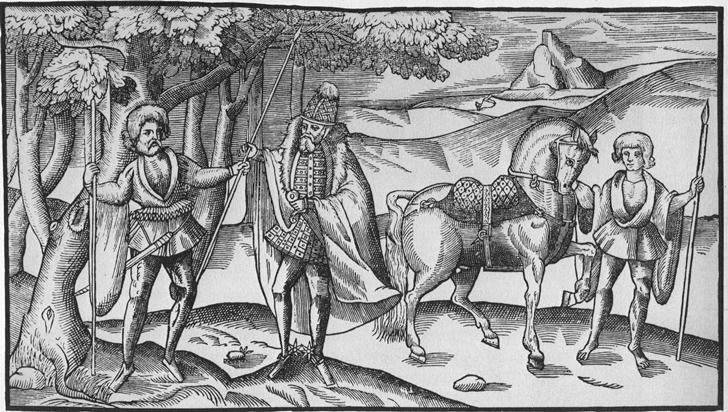 The pacing race-saddle horse was abundant and highly valued from at least 1000 AD in Britain into the 17th century--then it fell into disfavor, was ignored and finally lost. England received other horse populations, much more so than Ireland did which was further out in the ocean. The result was there was more of a dilution of their original Celtic Horse traits in Britain, so much so that by 1000 AD the natural speed and stamina of the original horse was noticed to be less than the Irish Horse possessed. * 1399- King Richard's expedition to Ireland reported that it was useless for his cavalry to try to outrun the Irish mounted on their Hobbies because they were much faster. At that time the Irish Horse (Hobbies) was said to be easily ridden 60 or more miles a day and still be ready to produce a burst of speed so great that the were able to run the English mounted troops down. * About 1450 Polydore Virgil, Italian cleric visiting England writes this observation: " A great company of their horses do not trot, but amble, pace..."
* From 1400s - 1500s, the Irish were engaged in wars with the English who subjugated them, seized their lands and property and redistributed them to their own gentry. Most records didn't survive there, but the Hobbies are spoken of highly not only for their gaits, but their speed, and they were shipped far and wide. The chief breeders of the racing Hobby then were Gerald FitzGerald, the 9th Earl of Kildare in the early 1500s--he died in 1539, Barnaby FitzPatrick, the 9th Earl of Osmond and Ossory, who died in 1581, and the Earl of Desmond from the same period. All three kept racing studs and raced their horses in both England and in Ireland. * In 1517 the Bishop of Armagh, in describing Ireland, sent a report to King Henry VIII "The land itself produces nothing but oats and most excellent, victorius horses, more swift than the English horses." * In 1522 The History of Great Britain, by John Mayer, printed in Latin, later translated to English "The island [Ireland] produces a kind of horse which the natives call Hobbies [Haubini] whose pace is the gentlest.They were called Asturies [Asturcones] in old times because they came from Asturia in Spain, and indeed the Spanish colonist brought these horses with them." (the Spanish colonists were Celts). * 1548-1687 Helmsley Stud--Hobby based racing stud (1635 Old Bald Peg foaled there). This stud was run by the Earls of Rutland. Cromwell destroyed it in 1644, the remnants of it were given to Lord Fairfax in 1651, who had the sense to take the aged Bald Peg and breed her to the Moroccan Barb. 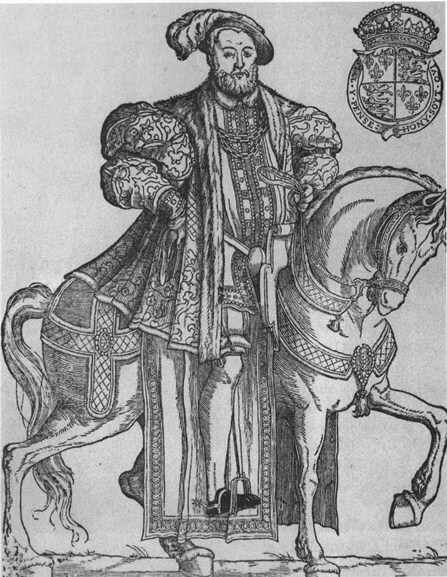 * James Stewart, King of Scotland 1567-1625, and King of England 1603-1625, kept a stable of Irish and English Hobbies. * 1565 ---Thomas Blunderville wrote: "The Irish Hobbie is a fine horse, having a good head and a body indifferently well proportioned, saving that many of them be slender and pin-buttocked. They are tender-mouthed, nimble, pleasant, and apt to be taught, and for the most part they be amblers and thus they are very meet for the saddle and to travel by the way. Yea, and the Irishmen, both with darts and light spears, do use to skirmish with them in the field and many of them do prove to that use very well, by means they are so light and swift." * In 1577 William Harrison published in Description of England : "Our horses are moreover are high, and although not commonlie of such huge greatness as in other places of the maine [Europe], yet if you respect the easiness of their pase it is hard to say where their like are to be had---Such as seene for the saddle are commonly gelded and now growne to be very deere among us, especially if they are well colored, just limbed and have thereto an easy ambling pase." * In 1577 in Description of Ireland Richard Stanihurst describes the Irish Hobbie 'of pace easier, in running wonderfully swift." * 1648-1731 Sedbury Stud---English Running Horse racing stud, was formerly property of the Wyvill estate and received by James D'Archy as a dowry with his wife Isabell Wyvill. He gathered the remaining Running Horse mares from the Fenwick and Newcastle studs along with Hobby mares from the Carelton stud for his broodmare band. * 1653 Old Moroccan Mare born ---by Old Moroccan Barb out of Old Bald Peg, who is the chief foundation mare of the English Thoroughbred, she was mostly Hobby. 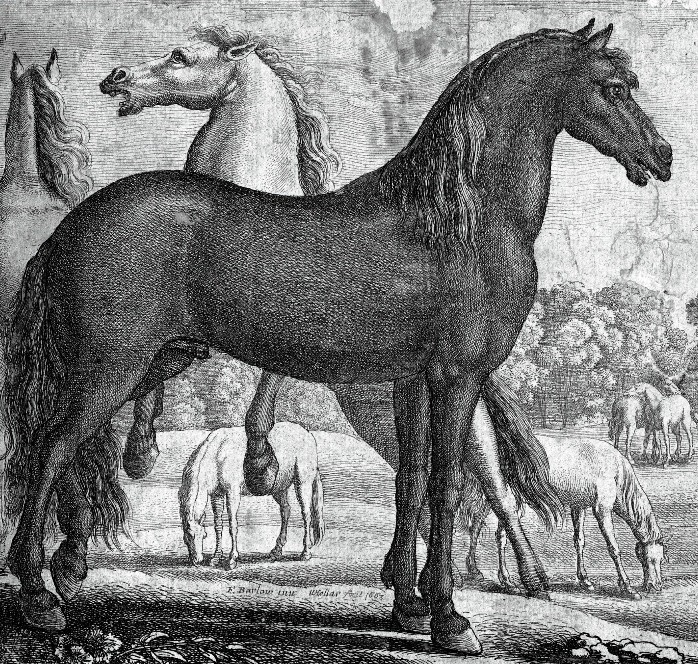 * In 1660 the Duke of Newcastle writes that the pacer was more common in his day--this is notable as it is just at the time of importation of the Helmsley Turk, a horse that began the fever for the Oriental, and ultimately with later importation of the Darley Arabian and Godolphin Arabian, resulted in the falling out of fashion of this most prized breed of gaited running horses. * The Sportsman's Dictionary 1735 London by H.J. Pye "The pad or ambling horse is chiefly desired for ladies; to produce such, let the sire be a Turk, and the dam a Scotch Pony (Galloway), or Irish Hobby, and these between them will produce a race that be natural pacers..."
The Hobby--Running Horse was a small, gaited, fast and stamina loaded racehorse, which was valued as well for saddle use, as its docile temperament and smooth gaits set it apart. The colonies received multiple shipments of these horses starting in 1611 and lasting until 1666, when trade with the British Isles ceased, and the Hobby was largely extinct in its homeland. Our influx of Hobby was before the Oriental elements had been added, except near the end of this period when strains of the Moroccan Barb may have existed in the stock. Can you see now that this root stock was documented as a sport horse from at least the Christian Era? And that even though both England and Ireland received the same Celtic Horse that by the 1500s it was clearly noticeable that the Irish version was faster and more agile with tremendous stamina as well? As breeders we know that concentrating desired traits makes them dominant in the strain, plus crossbreeding with a dissimilar type absolutely lessens the genetic impact of both. England had more genetic inroads with different class of horse (draft/farm) such as the Saxon and Norman horse. We can surmise that it was the genetic isolation that preserved the Celtic Horse more completely--more purebred if you will. We will see a similar scenario happen with our original populations of Running Horse, with Virginia being a surer preserver of the Irish Hobby especially, whereas Massachusetts discouraged sport in the beginning and had such a huge genetic mix from other types that it took the intentionally closed breeding operations of Rhode Island later on to recapture and concentrate a true sport horse again. Contrary to the common understanding of our colonial sport horse history, Virginia's product was 50 years ahead of the Rhode Island operations. Part II will cover the Virginia Running Horse, and Part III the Narragansett creation. References for this report and the next 2 parts.